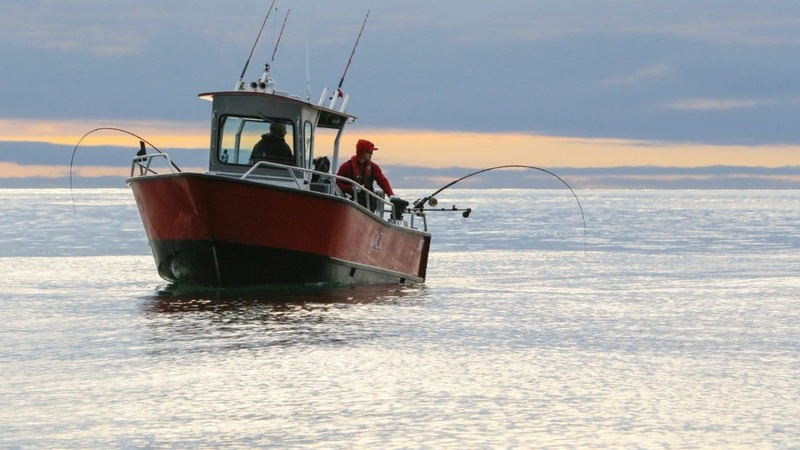 This past week the trend of calm seas continued, which made for an enjoyable week of fishing. So far this season we haven’t seen any particular spot out produce the rest, which has resulted in boats being distributed throughout the fishing grounds. On most days, the best successes often come by picking your favourite spot and sticking it out using the “stick, stay and make it pay” method of salmon fishing. Much like last season, I have continued to spend many hours each day working the kelp beds around the waters of Cape Naden. This past week my guests and I chose to spend nearly our entire days working Naden, with the occasional break to do some bottom fishing. We all felt that it looked really “fishy” and at times we enjoyed some great Chinook fishing with the odd Coho in the mix. On Thursday afternoon we decided to mix it up and give Parker Point a try after lunch. Although there were a couple fish around at Parker, we decided it was only fitting to finish the trip back at Cape Naden. Upon returning to Naden we watched another boat hook up on a couple of fish, but not much was happening for us. With only a couple of passes left, my guest was telling a funny story as we were trolling past the kelp bed off the point. Out of the corner of my eye I saw the rod tip dip down and then yelled “fish, fish, fish!!”. My guest grabbed the rod, set the hook, and the battle was on! This was the fish we had been looking for at Naden all trip…a real sizzler! After a few lengthy runs we tired the fish out and finally managed to put this 38lb Tyee in the bag to conclude a week of fishing. Back at the dock there were a couple of other Tyees that came in, with a 45lber being the largest of the day and of the trip. Let’s hope this trend continues and we continue to see some nice Chinook rolling through!